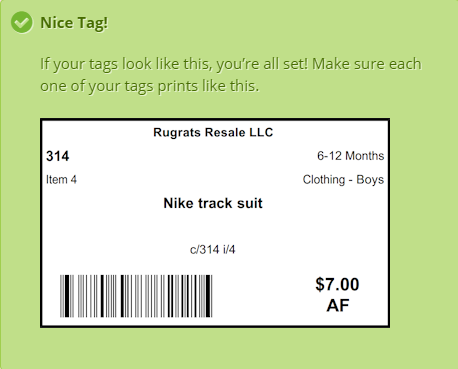 Tagging is the process of entering the items you want to sell into MyRugrats, printing out the tags, and securing them to your consignment items. It is important that your online inventory is accurate and your printed tags are well secured. Entering items into MyRugrats is the first step of the tagging process. Make sure you have your consignor number handy. If you still need an account, read through our Consignor Overview information on how to get a consignor number. It is important to select the correct category for your item so that sales tax can be applied appropriately. 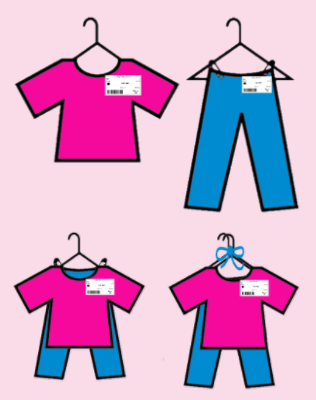 *Children’s clothing that is marked XS-XL should be translated to the proper numeric size as this is how it will be categorized for the sale. 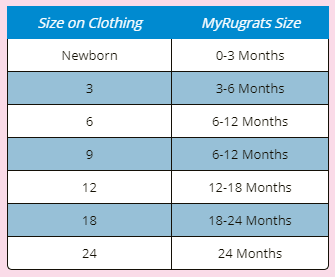 ​If you still have questions about sizing, please post to the Rugrats Consignor Support Group on Facebook. Do not enter sizing information in the description. Please do your best to select the appropriate size for your item in the field provided for sizing. Please make this as descriptive as possible. We use this field to pair lost tags with items should they become separated. Price items in whole dollar increments. The minimum price for any single item is $2. Group items that are worth less than $2 into larger packages. For advice from experienced Consignors, feel free to post pricing questions in the Rugrats Consignor Support Group on Facebook. 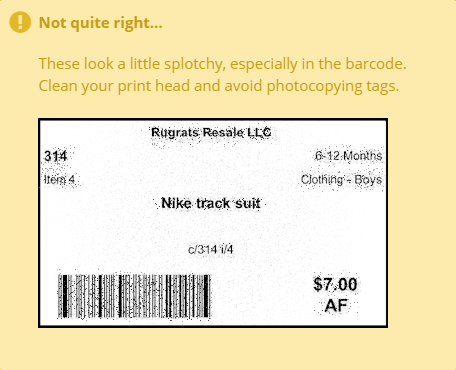 ​Refer to the list below to identify features of the Rugrats Resale item tag. 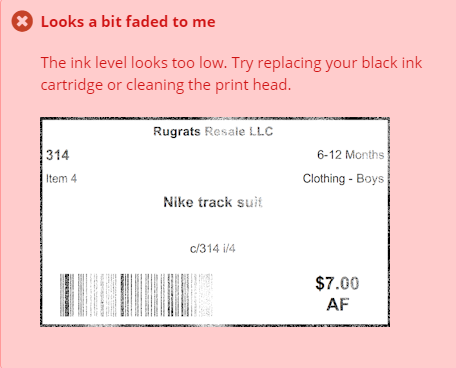 Once you have all your items entered into MyRugrats, it’s time to print! When printing, please use heavy paper. Anything 28 pound or greater should work. Tags should be printed on bright white paper, tags printed on colored paper will not be accepted. Finally, do not modify your tags by hand. 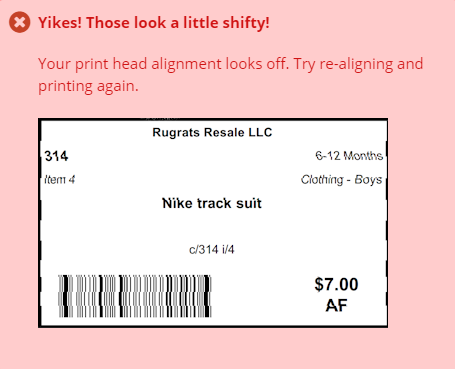 If you need to make changes to a tag, please make the change in MyRugrats and reprint the tag. 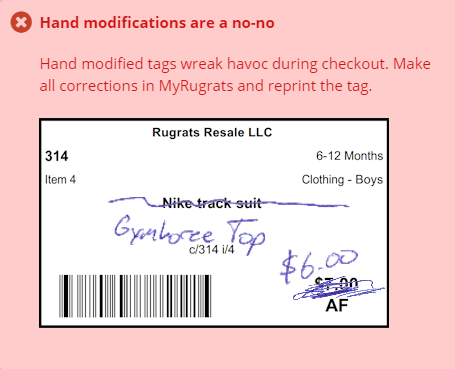 Hand modified tags can create a lot of confusion at checkout; therefore, they will not be accepted at the sale. go back to the Consignor Item Entry page and choose Print All Tags as PDF. * DO NOT use this option with Firefox on a Mac. 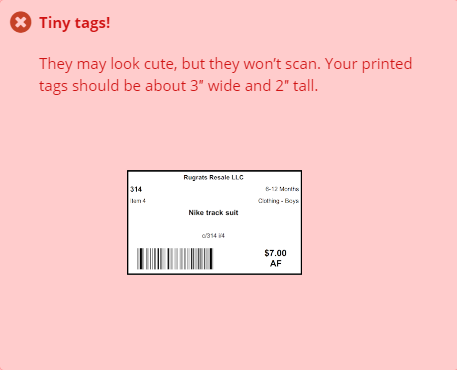 Print the rest of your tags! Pay special attention to the printed tags. 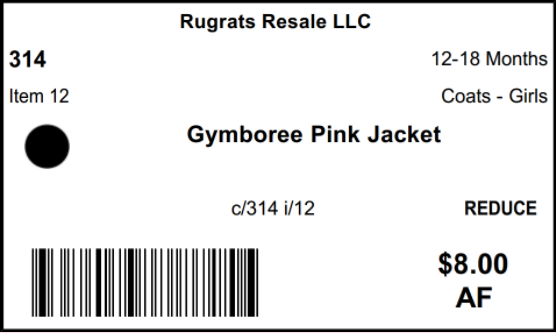 The print quality of the barcode is critical for making sure your item is properly credited to you during the sale. 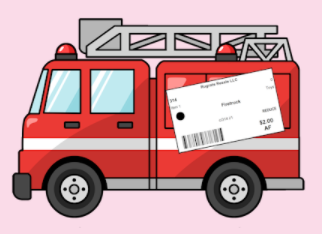 High quality tags speed up the checkout process and help keep our line moving. You will be asked to re-tag any items with poor quality tags during drop off. Secure clothing to hangers with safety pins. DO NOT USE STRAIGHT PINS! Your secured items should be able to withstand a fall to the floor without coming off the hanger. The hook of the hanger should be facing left, like a question mark. Hang a two-piece outfit with the shirt on a hanger, pinning the skirt/pants on with two large safety pins at the shoulder seams. Or, hang each item on separate hangers and tie the hangers together. Bundle multiple items on hangers together with rubber bands or string. This is a great way to sell onesies! Use safety pins** (not straigt pins) to pin the appropriate tag on the locations shown in the diagram. Please don’t hide your tags elsewhere! If we can’t find your tags, we can’t sell your item. Take care not to obscure any of the tag information, especially the barcode. Large Equipment PA state law requires us to spray any item with fiber fill that a child may have slept on. This includes pack ‘n plays, high chairs, jumaproos, bouncy seats, and strollers. It is important to use safety pins on these items to ensure the tag does not fall off during spraying. Please pin the tag on the headrest or seat of these items. Pack ‘n Plays should have the tag pinned on the outside of the short rail. For more details and to see a full list of items that must be sprayed, see the Spraying section at the bottom of the Accepted Items page. 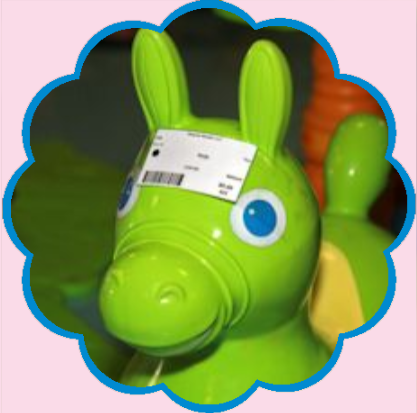 Toys Large items should have the sale tag attached with clear packaging tape. Small items and groups of items should be bagged in clear zip-top bags and sealed with packaging tape. Tape or pin the tag to the bag. Shoes Tie laces together or place shoes in zip-top bags sealed with packaging tape. Pin the tag through the shoelaces or attach with string or ribbon. Do not list shoes in a box, they will become separated. Books, DVDs, and CDs Place books, DVDs, and CDs in sealed zip-top bags. Use clear packaging tape to affix the tag. Small items such as bibs, hair bows, socks, etc, should be bagged and sealed. Do not tape the tag to a paper book cover or DVD sleeve as it may rip when removing it.